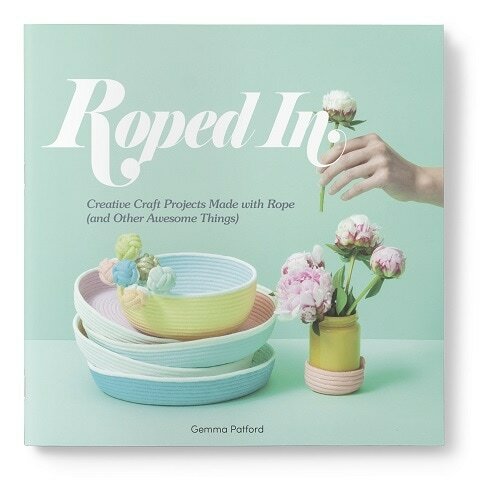 Get ready to be roped into Gemma Patford’s creative and fancy world with her book, Roped In. Gemma is a self-confessed maker and master illusionist who’s managed to convince her friends and family that she has her life together. Born into a creative family, it was only natural that Gemma followed suit. Starting out in fashion and migrating to general craft projects, it is her rope vessels for which she’s known. Roped In is going to show you how to make them, as well as other inspiring projects – including a rope coil lampshade, pink rope floor rug, friendship knot earrings, little leg pantaloons, cat tuxedo, and a 3D gingerbread centrepiece. Roped In is full of crafty do-it-yourself ideas that will make you appear both fancy and fabulous. Learn how to decorate and entertain, create festive holidays, make personalised gifts and discover your inner fancy. You may find yourself asking, ‘what makes Gemma the authority on crafty things, and how is she going to help me style up my tiny studio/dorm room/apartment while convincing?’ Answer: Gemma is very good at LIFE ILLUSIONS: Making simple things LOOK fancy. Let Gemma guide you past the smoke and mirrors and together you will create more than 30 projects to help you decorate, entertain, and dress up in style. With a background in pattern making, garment construction, fashion, textile art and styling, Gemma Patford is an accomplished maker. Her popular rope baskets are sold by over 60 retailers in Australia, the US and the UK. Gemma has also collaborated with some of the industry’s finest creatives including Anthropologie, Etsy, Koskela, Sight Unseen, Apartment Therapy and many more. With an impressive Instagram following of over 60,000 followers, she started the hashtag #ropedinbygemma as a way of basically convincing people to undertake fun art projects. Gemma’s bubbly personality makes her writing a joy to read both in print and in the digital world.